On the evening of July 16, 2005, after Barry Heimlich, Fred Griffin and I saw the four flamingos just north of our home, Mark Miller coincidentally provided very detailed observations of four Greater Flamingos he saw feeding in wetlands in SW Pembroke Pines, Florida. Our sighting occurred just a few blocks south of this location at just about the same time that Mark said they flushed because of a loud noise, so we presume these were the same birds. “Janine B.” reported (on the Tropical Audubon Society Bird Board that she saw a flock a little earlier that day in the same general vicinity. We then had to go away on a trip, but on the morning of July 30, Mary Lou and I visited these wetlands and saw no flamingos. (We did have a friendly Limpkin on the road). On the way out we talked to David Tringo, a nearby resident who said the flamingos had been showing up almost every day since around July 8th, when Hurricane Dennis passed by, at least up until the prior week. He said he photographed them (above photo) and that the flock numbered from “seven or eight up to about 20.” He said they were bright pink, and they waded into the water up to their bellies and were feeding. Mark had noted similar behavior. Mark also confirmed that they were Greater Flamingos. Hurricane Dennis was the first major hurricane of the season, the strongest Atlantic hurricane ever to form before August. After hitting Cuba twice as a Category 4 hurricane, Dennis made landfall July 10, 2005 on the Florida Panhandle as a Category 3 storm with wind speeds of up to 121 mph. As this image of the storm’s track indicates, the eye traveled north, off the west coast of Florida, producing sustained southerly winds over the entire peninsula. Hurricane Dennis was the worst hurricane to strike Cuba in over 40 years, crossing the Zapata Peninsula of Cuba, where the Greater Flamingo is a common resident (See this recent Field Museum report on this bird-rich area). It carried up many southern specialties to the SE US: Sooty and Bridled Terns, Brown Noddies, even an Audubon’s Shearwater that made it into Tennessee. Flamingos once roamed extensively over South Florida, but in recent years the only reliable sightings were of a flock at the southern tip of the peninsula at Snake Bight. This flock’s origins are uncertain. They may have flown in from one of the islands in the Caribbean and decided to stay. Interestingly, the Snake Bight flock was not seen at that location for about a year following Dennis. It is possible that “our” flamingos were swept up by Hurricane Dennis from Snake Bight or even the Caribbean. Another possibility is that they wandered from the free-flying flock at Hialeah Race Track, which is southeast of our home. One or a few of these birds are sometimes seen flying in the immediate vicinity of the Track, but larger flocks have rarely been reported. Broward County had not recorded any flocks in over 10 years. Flamingos are not known to breed in the wild in Florida. Our backyard lake has an abundance of Largemouth Bass. While I am not an avid fisherman, I enjoy wetting a line at times. Since the lake is fed by runoff from insecticide and pesticide-treated lawns, I would not think of eating anything that lived in it. So it is strictly catch and release. Top-water lures are the most fun, if conditions are right and the fish are taking them. Strikes can be dramatic, but the use of these lures requires considerable attention. More often than not I fail to set the hook firmly, and my fish are able to eject the lure by jumping high and shaking furiously. Fishing and birding, while not mutually exclusive, are not entirely compatible pursuits. It is impossible to use binoculars and a fishing rod at the same time. Many birds are attracted to the lake, so they are a source of distraction. However, if I had not been fishing I would have missed some great views of birds. Year round, Ospreys patrol the lake and sometimes dive with a wondrous splash, emerge, shake off excess water, and then if lucky, lumber upward with a catch. In winter, a Bald Eagle occasionally shows up out of nowhere to hijack the trophy. More common winter visitors include Caspian Terns, Ring-billed Gulls and one or two Belted Kingfishers. While fishing the evening of July 12, 2005 I looked up and was startled to see a flock of huge pink birds with long gangly legs, knobby “knees” and the unmistakable hooked bill shape of flamingos. They flew with outstretched necks and their flight feathers were black. Flocks of up to nine birds flew over our lake three times between July 12 and 16. The evening flocks appeared to be flying away from a point nearly due north of our home. We put out an alert on the Internet, and decided to backtrack them the next evening, July 15. Mary Lou and I walked nearly a mile north on a roadway that was under construction just west of our home, but failed to see them. Then, the next day we got a call from Barry Heimlich, President of the Broward County Audubon Society. Barry and BCAS Board member Fred Griffin wanted to see the flamingos, so they came over after supper and we walked along the same roadway. We were discouraged when it started getting dark and none had shown up, and started back home. 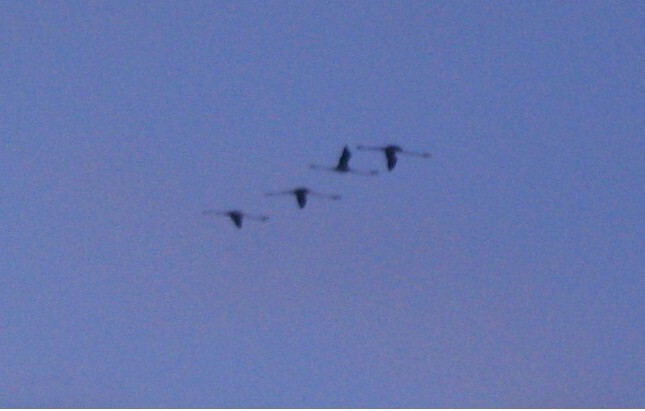 Suddenly four flamingos flew directly overhead (Barry took this blurry, but diagnostic photo). View subsequent related post here “Origin of Flamingo Flock”. Following my observation of the Muscovy Duck infanticide I was curious about what else might be killing off the ducklings, as relatively few seem to reach adulthood. This is surely a good thing, as our lake (which is only about 1/4 mile long and about 200 yards wide at most) seems to be at capacity and there is much competition and territoriality—except when some resident or visitor feeds them bread, in which case they flock together and beg. Early this year I found a hen sitting on 14 eggs under the Cocoplum hedge next to our back patio. Each time she left the nest she covered the eggs completely with down plucked from her breast, then camouflaged the nest with dried leaves. All 14 eggs subsequently hatched (photo), but her brood declined dramatically, day by day. I showed the nest to a young boy from Colombia who was visiting our neighbor. He dropped by to photograph the ducklings when they were 4 days old. That day there were only seven remaining, and the duck family was swimming about 15 feet offshore. Just as he went to take a picture, a large bass broke the surface and instantly disappeared with one of the babies. Certainly, Red-shouldered and other hawks, Raccoons, turtles and larger herons also take their share of ducklings, but so far I have not witnessed any more ducks killing their own babies. The most serious incident I have observed since the mass infanticide that I reported in January, 2005 has been one case of a drake chasing after a hen with a brood of about 8 chicks that looked to be about one day old. He tried to copulate while she was swimming near shore. She shepherded her chicks out of the lake and they huddled together while she ran away from the drake on the grass, away from the chicks. He chased her into the water and jumped on her, but she dove underwater. To my surprise she swam away underwater, about 15-20 feet before resurfacing. This evasive diving was repeated several times. He seemed to finally catch her and may have been able to copulate. Then he left her alone and she returned to her chicks after a few minutes. After I reported the Muscovy infanticide on a birding newsgroup, other birders described similar observations. One lady who lived on a lake in a nearby community wrote that she had been trawling the Internet under the keywords “Muscovy, duck, infanticide” and had found my posting. “I thought I’d get in touch because I have just witnessed the same behaviour as you describe re a Muscovy duck killing another’s chicks… (A)mong the many birds here is a Muscovy duck who started out with 16 chicks a week or so ago, but every day she has one or two less. She is now down to just five. We presumed perhaps a raccoon was using them as snack material, but now we’re not so sure because earlier this evening there was quite a flap outside and I looked out to see one of the male Muscovies running off with a chick in his beak. He was being quite rough with it, dropping it on the ground and snapping at it with his beak before keep picking it up and shaking it etc. It was quite horrible to watch as he seemed intent on injuring/killing it. A reader from South Africa added her observations, suggesting that parental inexperience may be a factor in this case: “I have a problem with my Mallard father. He is killing his own ducklings. I went onto the web and found your writings about the problem. The hen laid 18 eggs. 16 hatched. In the first week the male started attacking the ducklings. He took them in his beak and shaking them vigorously, he killed four of them. Just as I wanted to intervene, he stopped. “Now, three weeks later, he started again. I caught him and put him into a cage, but the mother did not stop quaking and he flew up against the wire. I released him again but this morning he killed another baby. I was wondering if finding another female might do the trick. The ducks roam freely. They love to swim in the pool. As far as I know, there was no disturbance or any stress for the ducks. The father duck was very protective at the beginning. Then all of a sudden he attacked the ducklings. “At first I thought he was only teaching them some manners (ha-haaa) but soon realized it isn’t case. This morning I separated the ducklings from the pair for two hours. As soon as I let them loose, he immediately attacked one. So, the “awful stepmother” took him to the house next door and put him in a bigger cage further away from the mother and ducklings. I have phoned a friend of mine to find me another female, so I will definitely keep you posted. In Texas Nature Blogspot, a nature writer describes infanticide in Purple Martins and summarizes theories as to the cause and value of this behavior.